« Festoon Lighting – new product! 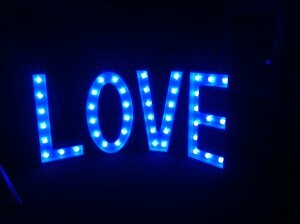 Based on the success of our current LOVE sign we have just invested in a new design – and this one changes colour! Our new LOVE sign is just amazing! It can be set to a colour of your choice – red, pink, purple, blue, turquoise, green, yellow or the traditional white. Our LOVE sign is 4ft tall and have a white casing which gives a contemporary look. The best feature about our new letters is that they have a colour changing option – these special bulbs give the option to change the colour to suit your wedding colour scheme. The effect is striking and really gives the perfect finish! 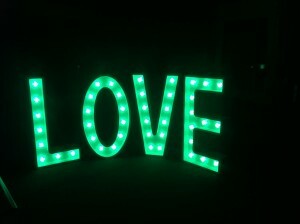 Photographers have noted that our sign are a great photo opportunity for both bride and groom shots, as well as the rest of the wedding party – especially if it is wet outside!